From Berenice Abbott, to Simon Norfolk, 18 photographers exhibit their work at the Barbican Art gallery. Constructing Worlds Exhibition at the Barbican Centre, Iwan Baan’s collection. When thinking about architectural photography, images of great masterpieces such as Gaudi’s cathedral “La Sagrada Familia” or London’s Tower Bridge often come to mind. Some may even recall the iconic “Lunch atop a Skyscraper”, 1932’s photo of New York’s builders lunching on a crossbeam. With that in mind, it is not common to associate beauty with an Egyptian derelict city turned into landfill, but that is exactly what Barbican’s photography exhibition, ‘Constructing Worlds’ is doing. 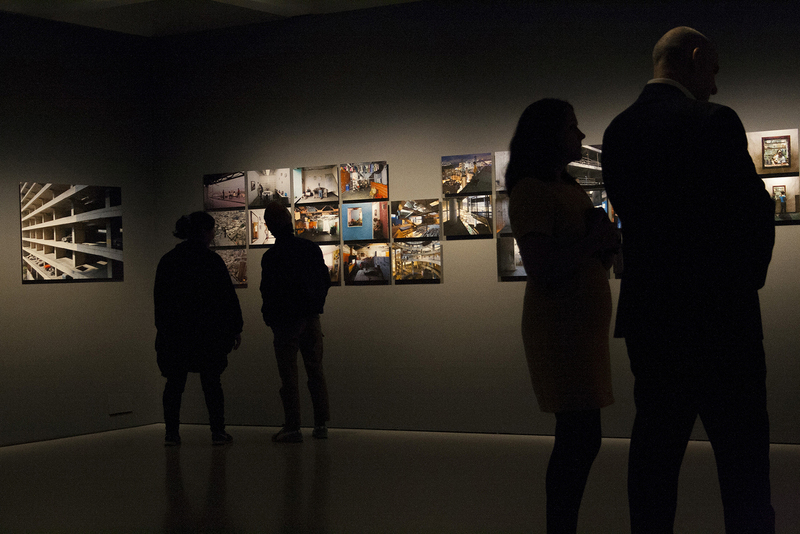 With 18 photographers and over 250 works, the visitors are taken on an arrestingly vivid, voyage around the world and through time. Making ageing brick and mortar alluring, the artists go beyond recording buildings and portray an insight into the societies whose lives revolve around them. Like Bas Princen’s ‘Garbage City’ in Cairo, depicting countless rubbish ridden blocks of flats, which at first appear abandoned, but then signs like clothes on the line, show that people live there, amongst all those black bin bags. Or Simon Norfolk revealing the reality in post-war Afghanistan, he transforms devastating scenes like a shipping container turned home surrounded by rubble, into fascinating pictures, by shooting during the blue hour, a time of the day before sunrise or after sunset when the sky is deep blue. One of the most bold and stylish collections is Iwan Baan’s; his stunning images colourful, geometrical, and highly skilled, illustrate how necessity is the mother of invention. He documents the illegally colonised ‘Torre David’, an unfinished skyscraper in downtown Caracas, Venezuela, intended to be a financial centre but left abandoned for 12 years before about 3000 people moved in. His images show how the residents really give a whole new meaning to the ‘exposed brick wall’ trend. The striking photography in this exhibition explores endurance and resilience during difficult times, and invites the viewer to reflect on the state of our modern society. How did we go from admiring ruins like the Greek Parthenon to living in shipping containers or decaying ‘Torre David’?